Today's card is another from a team color challenge I participated in. I loved this color combo as soon as I saw it, and quickly had a card put together. I stamped my sentiment first, in Basic Black, and quickly coated the stamping with clear embossing powder. After I heat set that, I stamped snowflakes across the panel and heat embossed them in clear as well. 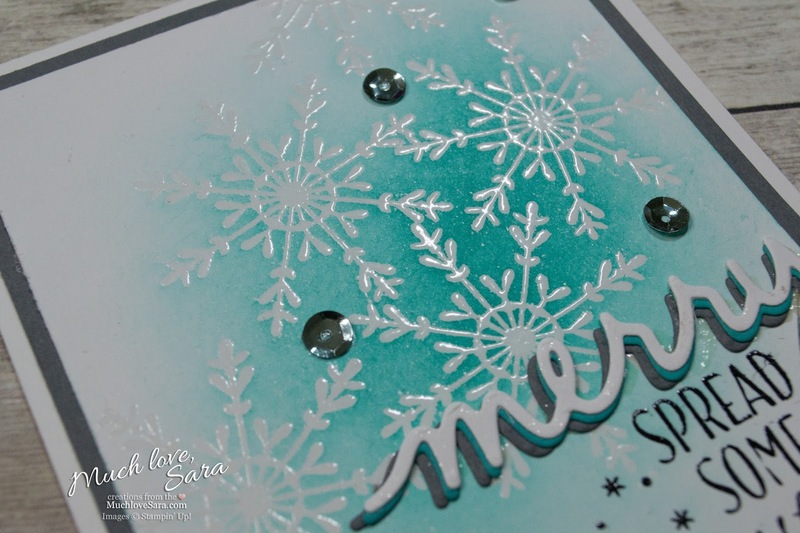 I sponged the Bermuda Bay ink across the embossed snowflakes, allowing the ink to fade off before the edge of the card. I die cut the word "Merry" 3 times and stacked the diecuts up, slightly off center. The top, white, die cut was coated with a bit of Wink of Stella. Then I scattered a few sequins around the card - just for some added interest and texture.